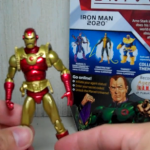 Fxfranz has reviewed one of the latest Marvel Universe HAMMER Files figures, Iron Man 2020! 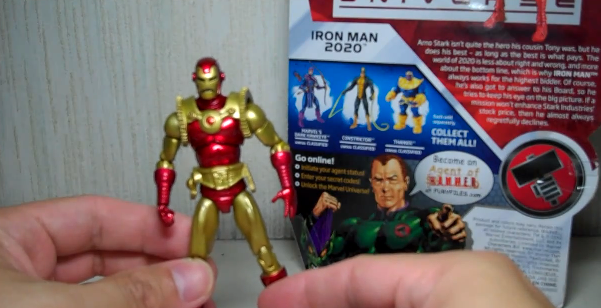 The following video review shows us the 1st Marvel Universe figure of Arno Stark, made with a retooled Classic Iron Man figure from previous waves. Seems like this line has a lot of Iron Men and Spider Men. I like this guy's reviews. Indeed, there's too many! The 1st Iron Man and Classic Iron Man got a bunch of repaints already! Same here, he has some straightforward reviews and his vid quality is good too. Saw this figure for the 1st time at TRU and picked it up. It's actually the same figure as the classic Iron Man mold but with a new head, harness, and belt. The torso is the exact same, just with a harness glued onto the arc reactor, effectively covering it. This is my favorite figure to use that Classic Iron Man mold. The harness gives his torso some bulk, making the previous versions look scrawny.